Czech game Attentat 1942 has been selected for one of the most presitigous competitions of the gaming industry, 2018 Independent Games Festival Awards. 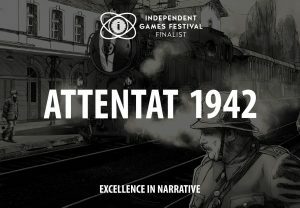 Together with five other games from all over the world, Attentat 1942 has been nominated for „Excellence in Narrative“. The awards will be announced on 21 March 2018 in San Francisco. Attentat 1942 is a unique video game that tells the story of Nazi occupation from the perspective of those who experienced it firsthand. The game is built on dialogues with survivors, interactive comics, and authentic historical footage. It was developed by Charles University and the Czech Academy of Sciences. It is the first game in the Czechoslovakia 38-89 project that covers different events from contemporary history. Revenues from the game are invested to continue research and science into the field. Attentat 1942 is a significantly enhanced version of the game “Československo 38-89: Atentát” that was released in Czech language in 2015. The development was supported by the Czech Ministry of Culture (NAKI DF11P01OVV030) and the Technology Agency of the Czech Republic (GAMA TG01010108).